Today is not a good day and for so many reasons. Last night was nice and relaxing. I'm taking JofH's advice and giving myself permission to do nothing. I skipped Yoga ... it's too friggin cold - and I know the temperature at Bikram is divine in this weather, but it's still hard to motivate myself to get to the warmth (and out of it after) in this weather. That and my jaw is still bothering me. Anyway, I went home and ate dinner and finished watching The Lost Room. Loved it. So annoyed that it was only 6 episodes and they haven't really left themselves open for any future ones. Oh well. It was still good while it lasted. And I finished my book - review should be somewhere below. And then I went to bed. Got woken by our call centre at 00:45 or so because they couldn't get hold of TheBrad. Which meant I was awake to see the pouring rain, lightning and thunder. And shocked because that's not supposed to happen in Joburg in Winter. Which is why my washing was outside on the line - how annoying. It's now still raining, and my washing is still outside! Added to this, I had serious pain in my jaw. I tried not taking the pain killers, I'm not really a fan of them and would rather not be taking them ... but at this stage it seems unavoidable. Then I smsed my mommy because I was in pain and she's the only one who loves me enough for me to wake her at such an ungodly hour for such a ridiculous reason. Anyway, with the help of the pain killers and my microwavable hottie, I eventually got back to sleep. Then I woke up and it was still all drizzly. Ordinarily I quite like this weather ... even more so when I get to stay home in bed with my book. But today I had to come in to work. And in typical municipal intelligence, en route to work I nearly rear-ended a garbage truck that was parked with no warning around a blind corner. Luckily I skidded to a halt in time and so did the car behind me. I realised on my drive this morning that although I'm not sad again today, I'm no longer calm and at peace with things, I'm scared. I'm scared of driving my car in the rain cause it does that weird aqua-plane thing sometimes when I brake. I'm scared of driving my car at night because sometimes it takes a few tries to start. I'm scared of all sorts of other emotional things and life in general and whether or not I've screwed it up completely. I'm scared that my jaw is still hurting ... is that normal? I'm also secretly scared about the clear weather-season issues we're having ... will it affect the possibility of me seeing the Wildebeest Migration in August? So this is how I start my day. But tonight I'm having dinner with JofH, so I'm looking forward to that and I know deep down that no matter what does actually happen between now and then, the chances are good that I will survive the day :) I hope ... well, I think I do. Lucky for me, I'm too curious about what is still to come to wish my life over now. Oh, and I promised a book review or two. 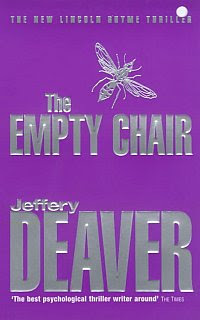 The first, which I finished over the weekend, was Jeffrey Deaver's The Empty Chair. I enjoyed this, like all of Deaver's Lincoln Rhyme novels. It has some great twists. 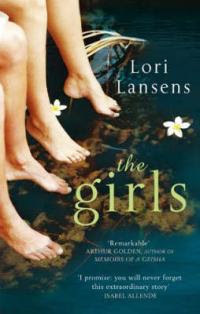 The second, which I finished last night, was The Girls by Lori Lansens. 'I have never looked into my sister's eyes. I have never bathed alone. I have never stood in the grass at night and raised my arms to a beguiling moon. I've never used an aeroplane bathroom. Or worn a hat. Or been kissed like that...So many things I've never done, but oh, how I've been loved. And, if such things were to be, I'd live a thousand times as me, to be loved so exponentially' In twenty-nine years, Rose Darlen has never spent a moment apart from her twin sister, Ruby. She has never gone for a solitary walk or had a private conversation. Yet, in all that time, she has never once looked into Ruby's eyes. Joined at the head, 'The Girls' (as they are known in their small town) attempt to lead a normal life, but can't help being extraordinary. Now almost thirty, Rose and Ruby are on the verge of becoming the oldest living craniopagus twins in history, but they are remarkable for a lot more than their unusual sisterly bond. You are not alone when it comes to feeling scared. Most mornings I wake up feeling scared that I have chosen the right career, that the situation happening between me and my ex-boyfriend/boyfriend is wrong and that something terrible could happen to me or my family and friends. I suppose the best thing is to just have some sort of faith that everything is going to be ok and maybe the less we are scared the less we are vulnerable. Ever watched "What the bleep do we know"? http://www.whatthebleep.com. If not, do watch it!! Have a good rainy Wednesday! I think scaredness runs in the family. And my jaw hurt for ages and mom kept making me put that stupid ice-pack on it. It was supposed to numb the pain, but it just made it worse! @suzzie - yep, i've seen that movie. I'm pretty sure these are all normal scared feelings ... I think it comes from being raised to do the right thing. I get scared I haven't made the right choices ... I just try to remember I made the choice that seemed the most right at the time with the info I had available. @akika - yeah, mom was telling me at 1am that you could only eat thru a straw for 2 weeks after your op. But yours was way more serious than mine, all 4 teeth at once!